the bone wars were never this much fun! The Great Dinosaur Rush, or the Bone Wars as they’re otherwise called, were a period of incredible advancement in paleontology (discovery of fossils). Players take the roles of paleontologists in the late 1800’s, competing to find the most lucrative dig sites, find the best bones and build the most unique dinosaurs for the world’s most prestigious museums. Gain notoriety by stealing bones, sabotaging dig sites and otherwise impeding the other paleontologists. You’ll need to play dirty if you want to win – just not TOO dirty! Full-color, easy-to-read rulebook. You can download the rules here. Players move across the board setting up dig sites and collecting bones. The board also tracks museum categories and the game round/phase. Players build dinosaurs secretly behind their screens. The inside of the screen also gives helpful info on game actions and how to build dinosuars. Bones are different colors for different body parts – green for head, ribs and spine, yellow for neck and tail and red for limbs. White bones are wilds and blues are ‘uniques’ that add decorative features to the dinosaur. One bag is used to secretly draw bones to populate dig sites on the board. The other is used to draw notoriety tokens randomly. Many actions in the game cause players to draw notoriety. Values range from 1-3. Players add notoriety to their score at the end of the game. But the player with the most notoriety SUBTRACTS it from their score. Paleontologist tokens mark movement between dig sites on the board. The matching cube tracks score. Buy The Great Dinosaur Rush from our store and get a pith helmet paleontologist meeple upgrade for free! These tokens mark the various museum categories and game round. Buy The Great Dinosaur Rush from our store and upgrade to dinosaur tokens for free! Build dinosaurs to match the dino parts shown on these cards and score bonus points! Players get a personality card at the beginning of the game that provides them some advantage in the game. Each card represents a real paleontologist, museum curator, artist, etc. from history. Players are paleontologists collecting bones and building dinosaurs for the most prestigious museums. Each turn, in addition to collecting bones, players will select various actions to perform. Some actions will gain players notoriety – secret tokens ranging in value from 1-3. Notoriety is revealed and added to players’ scores at the end of the game. But the player with the most notoriety is called out and their notoriety is subtracted from their score! Building dinosaurs using the discovered bones gives players a chance to unleash their creative side. The size and shape of your creations are limited only by your imagination! Richard Ham (Rahdo) has a lot of nice things to say about The Great Dinosaur Rush. It's a really, really clever game and that notoriety thing is so brilliant! I met up with Edo at BGG Con 2016 and he was over the moon about the game! This is without a doubt one of my favorite games this year and in some time. This game is stellar! It is stellar! Anthony and Frances from Ant Lab Games got a copy of The Great Dinosaur Rush and really enjoyed it, too! Cardboard Republic gave The Great Dinosaur Rush its Seal of the Republic. and Father Geek says it’s Gamer Geek, Child Geek and Parent Geek approved! 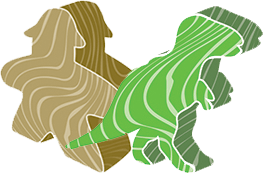 Make no bones about it: The Great Dinosaur Rush is a splendid example of game design that is familiar enough to be easily learned while still finding ways to tread into new territory. If you enjoy games where creativity and critical thinking are blended together, where an opponent is but one more aspect of the game to manipulate, and dinosaurs, then do sit down and play The Great Dinosaur Rush. Daniel Solis is second to none when it comes to rulebook layout, and his work on The Great Dinosaur Rush is no exception. See him fast-forward through his layout process in this 10-minute Twitch video. Hello everybody! My name is Scott Almes, your friendly neighborhood designer of APE Games’ title, The Great Dinosaur Rush. The Great Dinosaur Rush is a very personal game for me, as when I was a kid I had a strong desire to be a paleontologist. Although I later decided on engineering (and game design!) I never stopped being fascinated with dinosaurs. However, as I grew older, I started to learn not only about the dinosaurs themselves, but also the people who discovered them. It didn’t take me long to discover one of the most fascinating periods in scientific history: The Great Dinosaur Rush. Buy The Great Dinosaur Rush from our store and get exclusive paleontologist and dinosaur meeples! The Great Dinosaur Rush can be played by 2-5 players, ages 10+ in about 60 minutes. Buy the game from APE Games and get exclusive pith helmet meeples and dinosaur tokens for free! I would like to pre-order The Great Dinosaur Rush, but according to Ookodook, the cheapest shipping to the UK is $33, which is almost the cost of the game. This is also for “1st Class Shipping”, and they don’t seem to have any cheaper options at lower classes of shipping. Is there anyway that you can deliver to the UK cheaper than this? I would love to get the game, but that amount of shipping is a problem. Unfortunately the price given is our price for shipping to you. If it’s any help, our pre-order price is $10 US off MSRP. The Great Dinosaur Rush will retail for $50 and will not include the custom dinosaur and paleontologist meeples. Our site price will raise to $50 once the game is in stock, so that we don’t compete with retailers. The Great Dinosaur Rush will be available in stores worldwide, while supplies last. The game will be available in the UK via normal distribution channels. Ask your local store to pre-order it now – it should be available in the next 60-75 days. Hi guys, will there be a German edition of the game or will I have go import it from the U.S. or the U.K.? There are not immediate plans for a German version, but the game is available through German distributors (in English). Hi guys, i am going to Essen in 2 months, can i preorder the game and get it there ? That would save us from the shipping costs and it would definately sellout!!! Are you joining the Essen fair? Is a pick-up possible? No sorry, no Essen fair this year. Just want to say that I’ve really been enjoying The Great Dinosaur Rush (tGDR), and am getting a lot of enjoyable play out of the game. See my blog entry, http://jkahane.livejournal.com/1791909.html, for a good example of play this past Sunday. That said, I do have a couple…well, a few…questions about the game. First off, while it doesn’t state so in the rules that I can tell, is a player allowed to get the bonuses from two Dinosaur Bonus cards if they are able to complete the patterns on both cards exactly? Or is one limited to one bonus per dinosaur built? Second question: When building one’s dinosaur, does one have to have the minimal complete structure (Head, Neck, Spine, Ribs, Limbs, Tail) in order to score any points during the Exhibit Phase? If one doesn’t have a complete basic skeleton, does the player in question score any points at all? Third question… For the Astrodon card, is one still required to have a set of Ribs connecting to the red limbs? It’s not clear from the illustration on the card. Fourth question… For the Icthyornis card, should the player still have a set of Ribs or Spine connection to the wing Limb structure that the card rewards the player for? Fifth question… When building the dinosaur, can one have more bones in a given section represented by one of the Dinosaur Bonus cards and still score the points for the card, or does the section of bones on the card have to be completed exactly as is with no extra bones in that part? And finally… For the Dynamite Notorious Action, can one do this in a dig site that has no bones, and thus draw three bones from the bag and replacing no bones from the dig site into the bag? Yes, a player can complete two cards in one turn if both cards are completed fully. You must have a minimum dinosaur, period. You cannot end the build phase without a complete dinosaur. You start with a minimum set of bones, and you cannot ever lose those. I’m not sure what’s not clear with the Astrodon. You must have those green bones and red bones in the locations specified. Same thing with the Icthyornis. Just build it like the card and you’ll be fine. You cannot score the bonus if you have more or fewer bones than on the card. Yes, you can dynamite an empty hex. Oh, and thanks much for the blog entry! Enjoy the game. Just a quick clarification. In the case of the Astrodon and the Icthyornis, since you still need a minimum dinosaur, that means the “wing limb” of the Icthyornis must still be connected to Ribs, right? Even if the card doesn’t seem to indicate such? Just want to make sure on these two. I’m still not 100% sure about your question, but does the fact that the rules don’t say where the limbs need to be attached help? Under the rules, you can hang limbs off the head, if you want. In the case of the dino bonus cards, they need to be placed where the card shows. So yes, the “wing limb” is off the spine, but the card doesn’t say how long the spine needs to be. You’re right – that dinosaur is invalid because the wild bone becomes the color of the spine, not the tail. APE Games was founded in 1997 by Kevin Brusky, then a software engineer at Compaq Computer Corp.
APE's first game, Dark Horizon, was an ambitious endeavor involving pewter Grenadier cyberpunk miniatures. APE Games is based in Houston, TX and have warehouse space both there and Fort Wayne, IN. Fun trivia - the APE in APE Games is an acronym for Advanced Primate Entertainment!